In this industry, our name is renowned as one of the eminent manufacturers, suppliers and exporters of Debris Protection Net. These nets are designed and made by employing supreme quality base materials and sophisticated machines. 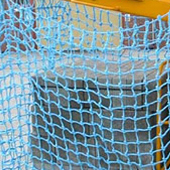 Widely used in construction sites, these nets are very durable and have the ability to withstand harsh weather conditions. These nets are available in various dimensions and colors & can be customized as per the specifications provided by our valuable clients. Our patrons can avail from us a wide range of Debris Protection Net and that too at very feasible prices.